This page provides an overall view about the PR Campaign provided for A' Design Award Winners. Designers, artists, architects and brands join design awards and competitions for a multitude of reasons, however our research and survey results indicated that it is very important for the competition participants to firstly reach a wider audience (design enthusiasts, press members and potential buyers) to showcase their results, in addition to peer recognition and business opportunities. Since A’ Design Award was developed based on the needs of participants, we understand why PR, i.e. public communications and relations are important for talented entrants. Thus, to create a real value for the participants of the competition, we have designed an extensive PR Campaign for winners. 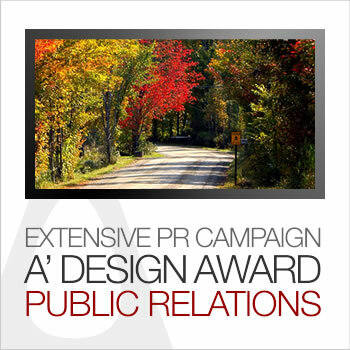 The A' Design Award PR Campaign consists of several layers of services. The first layer is the Core Components package, this is followed up with PR and Media relations services that consists of pitching media and making sure that winners make the most of the media, this is followed up with social media services to reach a different audience; namely other design enthusiasts, and finalized by visibility package that allows winners to be found easier when others are searching for relevant products and services. Winning the award itself is a prestige, for this reason, each A' Design Award Winner is provided a series of services to make the most out of it. Most importantly, winners are granted the right to use the A' Design Award Winner logos, to highlight the design value within their products, designs, projects and services. Second, A' Design Award & Competition organizes an annual exhibition at Italy, where winners are presented and communicated to the public through a press conference. Winners are also granted a proof of winning i.e. a certificate for winning the award, and they are also given a certificate for taking part in the exhibition. Furthermore, all winner works are included in the A' Design Award Winners yearbook which is distributed to both winners and media members. The A' Design Award Gala-Night for Award Celebration, allows both networking opportunities, and provides winners additional opportunities to have their photos taken during celebration, during the transfer of the trophy, and the certificates. Finally, winners are provided a guideline booklet about how to "Get more from their award", allowing them to get best of winning the award. The Media Relations PR Service is provided by DesignPRWire to all A' Design Award Winners free of charge, and consists of various services aiming to place A' Design Award Winners at media. The primary purpose is to provide further coverage and dissemination for their winning works. These services include but not limited to: Press Release Preparation, Press Release Distribution, Pitching Media for Editorial Inclusion of Winners, Communication to Blogs and Magazines, Advertising Winners at Partner Media, Providing an Interview with the Designers, Providing a Press Kit with Photos of the Designer and visuals of their works, Direct Media Placement through DXGN and IDNN Networks, Making further press releases and their distribution through the A' Design Award Platform. Social Media PR Service The Social Media PR Service utilizes the best of social media to communicate award winners through active and prominent networks via frequent updates, image releases, and more. The aim of the social media service is to capture audiences that are not following the traditional media, thus providing winners a further way to reach more people to communicate their services to. Furthermore, we communicate winners to the those who were registered to our newsletters. A' Design Award and Competition has developed very specific functionality follow, promote and highlight you in social media with daily interactions via Design of the Day, Design Team of the Day, Designer of the Day, Design Legend of the Day, Design Interview of the Day and Designer Highlight of the Day daily campaigns in addition to Share @ Social and Follow @ Social functionalities to ensure that your design award victory is celebrated in multiple days and in multiple occasions, featuring you and your works as often as possible. The Visibility PR Service aims to make our winners easier to be found than others; A' Design Award & Competition devotes significant time to make sure that when people search for your brand name, they will also see and know that you have been a winner of a prestigious design award. This is made possible by a profile listing at A' Design Award & Competition, through the media placements, press releases and furthermore winners are included in two prominent listings of their choice within the ListOf.Net platform, making them to be found easier by search engines. In addition winners are also listed at several platforms that ranks or displays our winners such as: Award Winning Designers, Best Designers Lists, List of Winners, Designer Rankings and World Design Rankings, Salone del Designer platform and Designer Interviews website. 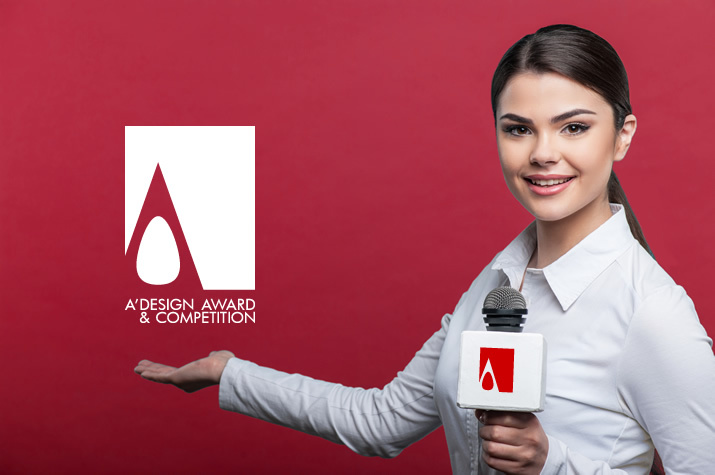 A' Design Award and Competition aims to provide publicity and advertisement opportunities to its winners by including PR Services within the coveted Design Prize.